The GW Chile program allows students to experience a country that is beginning to play an important role on the global scene. In Chile there is a vibrant mixture of people influenced by indigenous civilizations, colonial legacies, and an influx of immigrants. 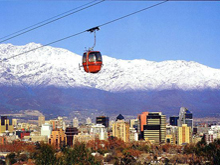 Studying in the capital city of Santiago is an exciting opportunity to experience the political and cultural challenges of democratization, international trade, and development. In Santiago students find themselves in an immersive program, in which they live with host families and are constantly exposed to the Spanish language. They live the life of a Santiaguino, commuting daily to the university and interacting with Chilean classmates. In this environment, students begin to perfect their Spanish skills, acquiring an invaluable asset for any future career. 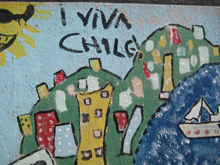 Students take courses from the Universidad de Chile, the oldest and most prestigious university in Chile, which offers courses in 69 undergraduate programs. Students also take courses at the Pontificia Universidad Católica. In this way, GW Chile participants experience both university environments simultaneously, with full access to the facilities and extracurricular life at each institution. The GW Chile program offers three optional GW courses: Historical Memory and Human Rights in Chile, an Advanced Spanish Oral Communication course with a focus on Chilean culture, and the option to do an internship for credit. With an on-site resident director who provides ongoing support throughout the semester and arranges cultural activities and excursions for students, the GW Chile program offers students both the experience of a new life in Chile and the familiarity of an ongoing GW community. Please refer to our Advising Services page to find the correct advisor for your school or stop by during open office hours to learn more about the program and application requirements. Rosanna Giorlandino, GW Chile student and dual Fine Arts/Spanish and Latin American Languages, Literatures, and Cultures major, has earned a featured spot on GoAbroad.com with her essay on American misconceptions of Chilean life, "Leave One America Behind for Another." Learn More About the GW Exchange Program Scholarship! The GW Exchange Program Scholarship provides up to $1,500 for semester study for GW-exchange or GW Chile Study Program. Interested students can submit an application to be considered for the GW Exchange Program Scholarship through their GW Exchange or GW Chile application.